The Automation industry uses a wide range of control cabinets on the factory floor. 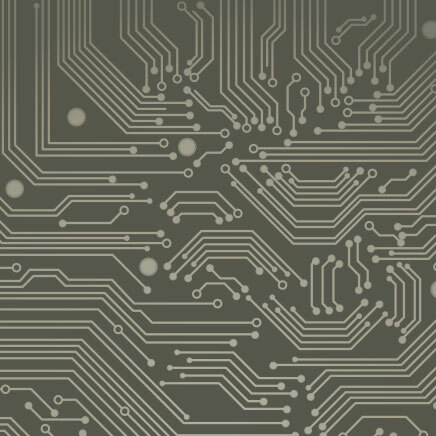 Process parameters being monitored and controlled frequently require signal conversion and/or isolation before being connected to PLC analog input channels. 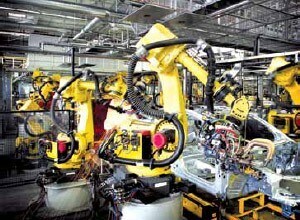 The Automation industry deals with process monitoring and control in factory floor manufacturing applications. Modern factories need to monitor a wide range of process parameters requiring a higher number of signal conditioners. All factories have the need to be more efficient and save costs by conserving energy and saving space wherever possible. Control cabinets located out on the factory floor house a wide variety of equipment typically mounted on a DIN rail inside the cabinet. 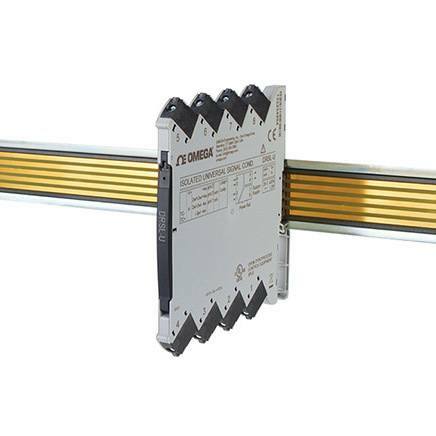 Equipment can include PLCs, signal conditioners, power supplies as well as DIN rail interconnecting blocks. The increasing trend towards cost savings in factory automation applications makes the need for saving space evident. The larger the signal conditioner the more space it takes up inside the control cabinet thereby generating increased costs in cabinet size. Larger cabinets also take up more space on the factory floor. The need for signal conversion can come in a wide range of input/output (I/O) possibilities. Signal conditioners with fixed input/output ranges necessitate a different module for each input/ output combination. Non-isolated signal conditioners will not effectively block ground loops or other spurious voltages from passing through the signal conditioner and possibly damaging sensitive downstream equipment such as the PLC or data acquisition system. Signal conditioners with higher power requirements necessitate using larger power supplies mounted on the DIN rail inside the control cabinet which can take up more space and generate excessive heat. Older signal conditioners can typically be up to 25 mm (1") or more in width and require air gaps in between modules to allow heat transfer for cooling. Consequently 50 units can take up 1.25 m (4.1') or more of DIN rail space, which depending on the size of the control cabinet can lead to 1 or 2 rows of signal conditioners. The DRSL-U accepts thermocouple, RTD, linear resistance, potentiometer, voltage or current input and converts these signals to linear voltage or current output. The unit offers isolation between input, output and supply, provides surge suppression and protects control systems from transients and noise. The DRSL-U also provides electrical isolation and eliminates ground loops and can be used for measuring floating signals. 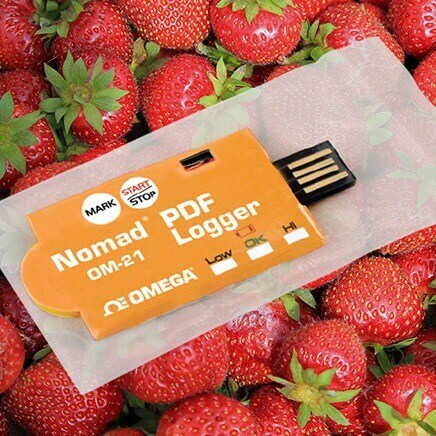 The DRSL-U is space efficient and has a slimline housing that is only 6 mm (0.24") wide. 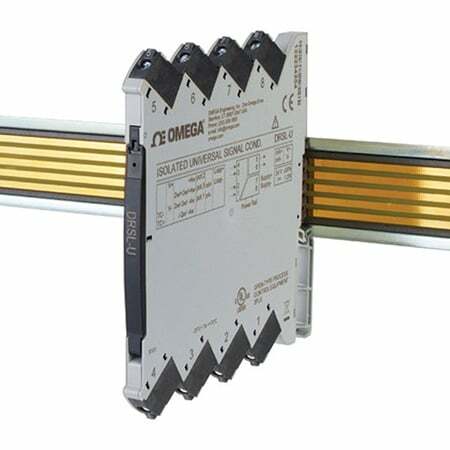 Up to 50 units can be mounted on a DIN rail in the control panel and occupy only 30 cm (11.8") on the rail. 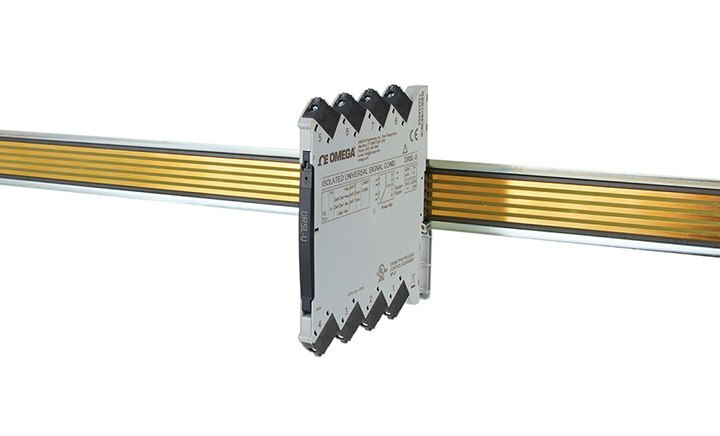 The DRSL-U’s low power design makes the typical 24 Vdc power requirement for 50 units only 40 W. DRSL-U signal conditioners can be stacked either vertically or horizontally and do not require an air gap in between modules which takes up additional space. The DRSL-U is easily configured by using the DRSL-DISPLAY programming interface in conjunction with the DRSL-ADAPTOR configuration adaptor. The DRSL-DISPLAY has a 4-line LCD display with scrolling help text in 7 languages (English, French, German, Italian, Spanish, Danish and Swedish) which guides the user through all the configuration steps. The DRSL-U is designed with electronic hardware switches, consequently it is not necessary to open the device to set any internal DIP-switches.